The most successful part of Tafi's career was spent with the Italian super-squad Mapei–CLAS. In the 1996 edition of Paris–Roubaix the team put four of their riders in a breakaway at the front of the race: Johan Museeuw, Gianluca Bortolami, previous year's winner Franco Ballerini, and Tafi. Ballerini had a flat and was out of the lead group, but the other three powered their way to the finish. 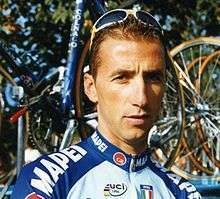 In 1996 Tafi won the "race of the falling leaves" Giro di Lombardia, using his strength to overcome the climbs of the race. He said that his dream was to emulate his cycling hero fellow Italian Francesco Moser, which is to win Paris–Roubaix wearing the Tricolore jersey as the Italian National Champion. He accomplished this in his win in 1999. He won Paris–Tours in a long breakaway effort in 2000, foiling the sprinters' teams. After a few lacklustre years, he again shone in the 2002 edition of the hilly, cobbled classic Tour of Flanders. Having established himself in a front breakaway with the likes of Johan Museeuw, Peter van Petegem and teammate Daniele Nardello, he made attacks after attacks, finally taking advantage of a moment's hesitation between the two home favorites Museeuw and van Petegem to solo to the finish for the win. After the demise of the Mapei super-team, Tafi moved to the reformed Team CSC under Bjarne Riis for the 2002-2003 seasons. His time with team Alessio–Bianchi in 2004 also didn't re-ignite his performance. He finally moved to the new Saunier Duval–Prodir team for his last season in 2005. Tafi's name was on the list of doping tests published by the French Senate on 24 July 2013 that were collected during the 1998 Tour de France and found positive for EPO when retested in 2004. ↑ "Andrea Tafi, il Gladiatore" (in Italian). museociclismo.it. Retrieved 21 September 2012. ↑ "Italian National Road Championships - CN". autobus.cyclingnews.com. Retrieved 21 September 2012. ↑ "Andrea Tafi wins Paris - Roubaix 1999". cyclingfever.com. Retrieved 21 September 2012.